The sun is setting, and the snow is melting outside the tropical greenhouse in Uppsala Botanical Garden. This weeks challenge over at The Sew Weekly was to make something inspired by the town you live in. 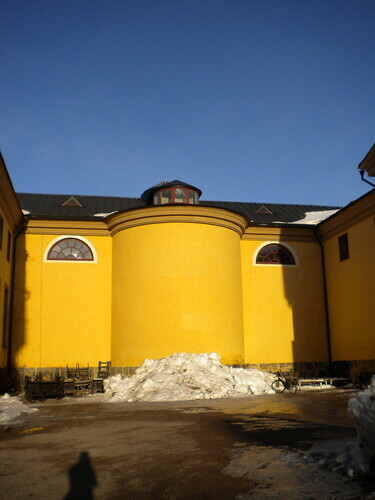 Now, I live in Uppsala, and apart from having a really old university, a really big (and old) church, and even older (but smaller) church, a half- made castle and generally being old and nice, Uppsala is the home of some impressive historical people. One of them who is still most visible (despite being dead for 233 years) is Carl von Linné aka Carolus Linnaeus. He wasn´t born in Uppsala, but lived here, and was a professor at Uppsala University. Probably one of the most well-know people from Uppsala, Mr. L himself. If you´re not familliar with old Charlie´s work, he is the father of modern taxonomy (the science of finding, describing and naming species of living or fossil organisms). 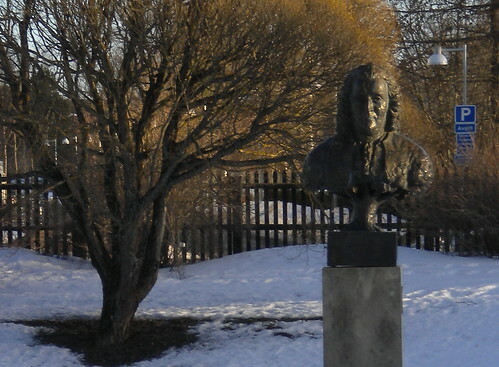 In his lifetime he collected plants and seeds from all over the world, and this can be viewed in Uppsala, we have at least three botanical gardens, all having in one way or another to do with mr. Linné. Uppsala castle, and the botanical garden covered with snow. Yes, and me and my skirt. 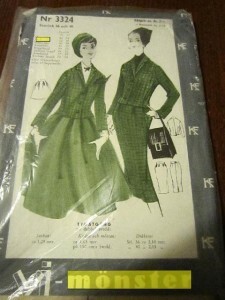 So, I thought it would be aprropriate to make a skirt inspired by all of this. The fabric has a rose print, or a flower from the Rosaceae family, if you wish. 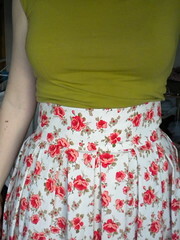 A less windy view of the skirt, pleats please! 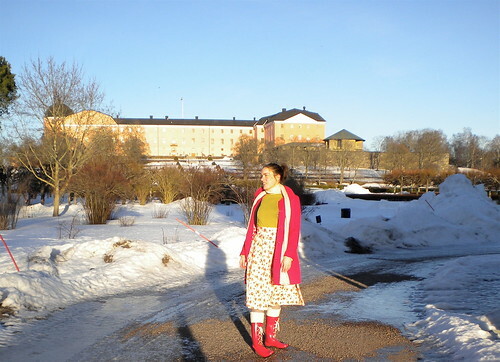 The skirt pattern is based on a swedish vintage pattern, Vi-mönster 3324, I just changed the waistband and made it a bit wider. I love your skirt! The fabric is so pretty! You live in a beautiful city, Solvi! I love your skirt; there’s something so feminine and pretty about a rose print skirt. Your red boots are awesome!! 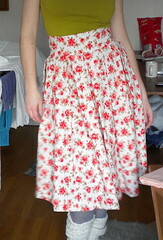 The skirt is lovely,I really like it. I thnk it will be a good one for summer too. How nice to see the whole of you in the photo too! BTW, I am jealous of your red boots.